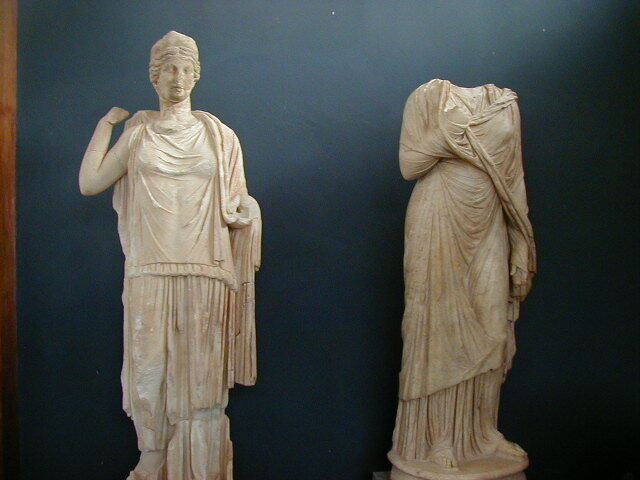 Aphrodisias was an important Greek/Roman city, famous for its school of sculpture. 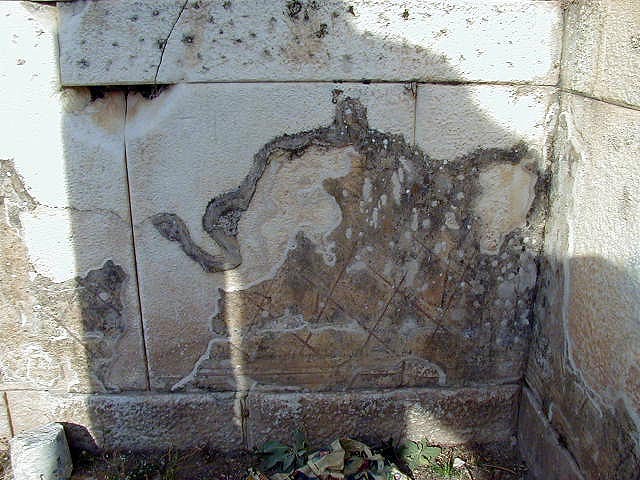 The city was described in ancient documents but disappeared for many centuries. In the 1950's a determined archaeologist decided to search near a village so rich in artifacts that people were using sarcophagi for feed troughs for their animals. He started digging and found a city. 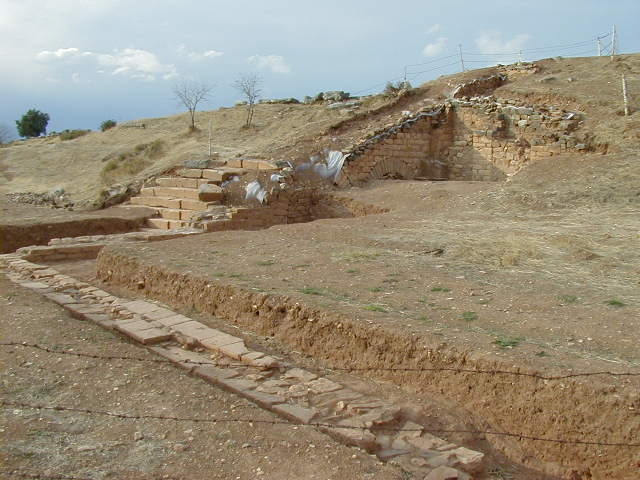 There is still a lot of digging to be done, but even the partial excavation and reconstruction is amazing. 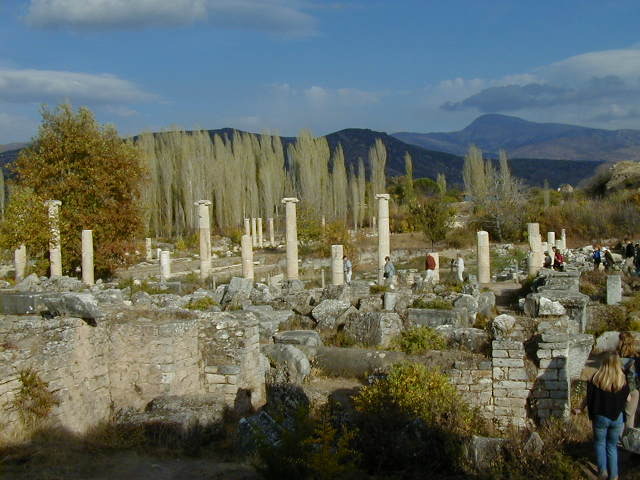 Unfortunately it is kind of hard to reach; I spent more than eight hours on buses and dolmuses to be able to spend less than two hours at Aphrodisias. It was worth it. 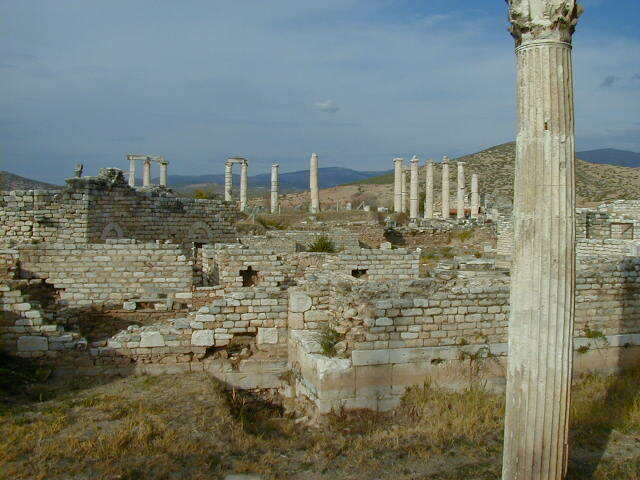 There was one tour group at Aphrodisias when I was there, but the group stayed in a tight little pack. Other than them I had the city to myself. 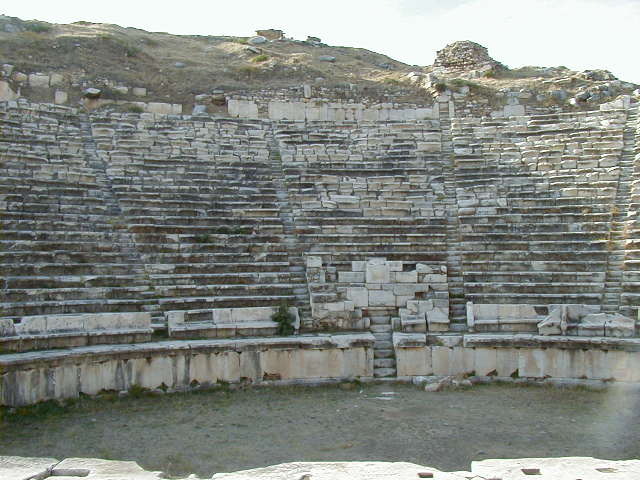 I wandered from one site to the next, starting with the theater. 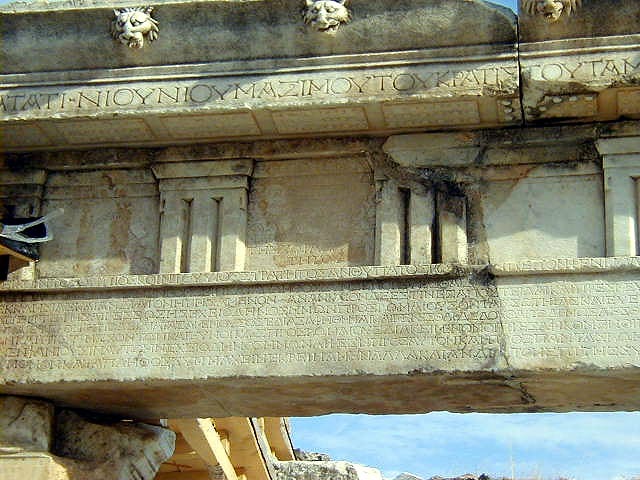 This theater has interesting details I'd not seen at others, such as the names of theater supporters on the lintels behind the stage, graffiti on the seats, and remnants of the decorative stucco covering the walls. From the top row I got a view of the city. 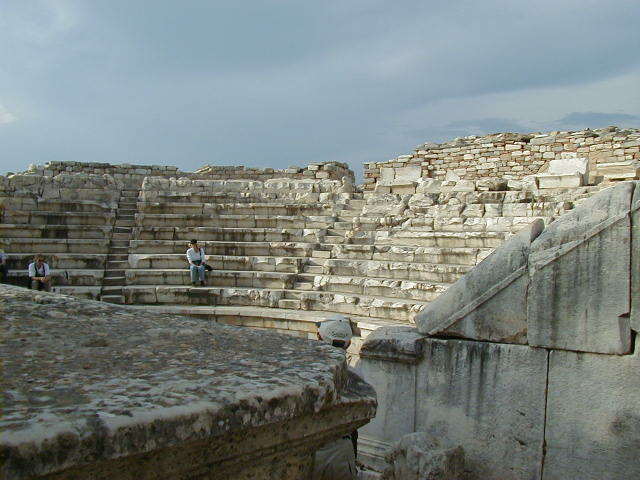 From the theater I moved to the Baths of Hadrian. Once again, note the raised floor for the heating system. 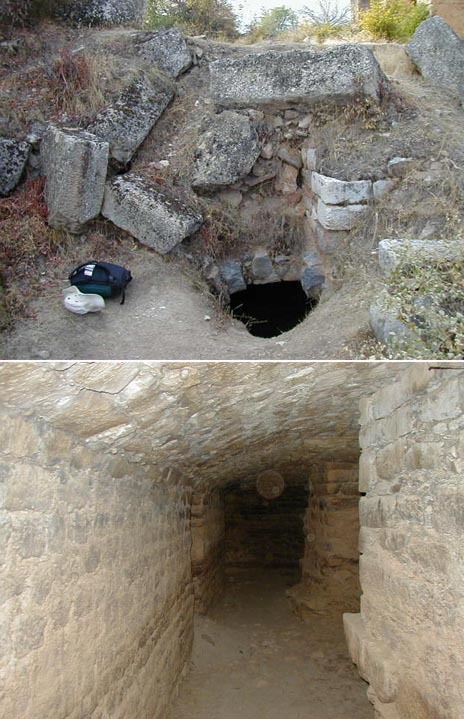 The Baths aren't that exceptional, but adjacent to them I found a hole in the ground that looked intriguing. Of course I would never venture into off-limits areas, but there were no signs saying "Please do not drop through the hole in the ground". So I had a look. That's why I always carry a small flashlight when I travel, I would hate to miss opportunities like this. There wasn't a great deal to see, just some dark passages underneath the Baths. But it's fun to look. 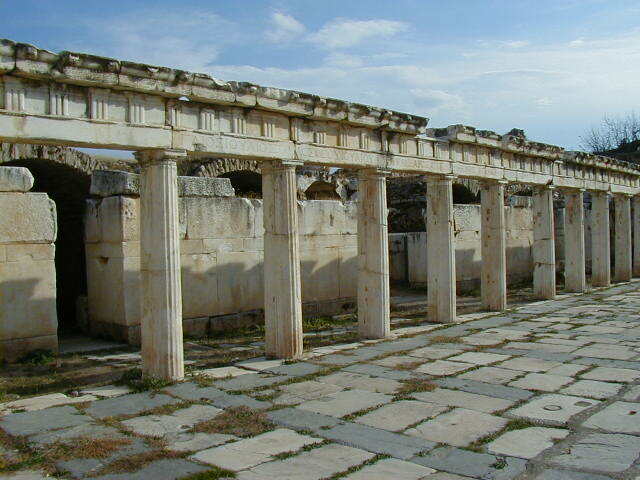 Across from the Baths of Hadrian are the Agora Portico of Tiberius, the first picture below. 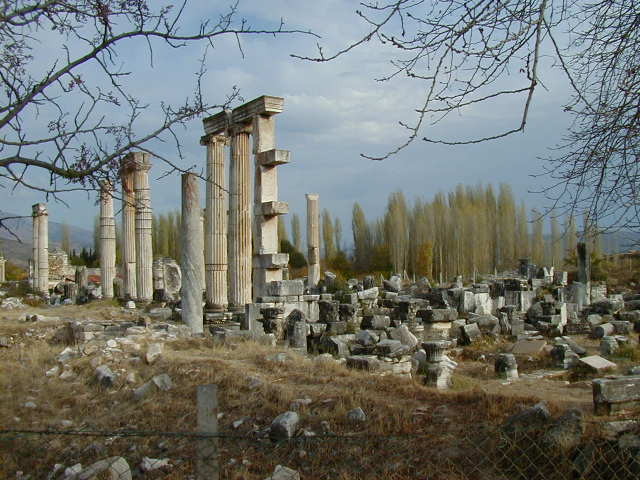 After it is the Bishops Palace with the Temple of Aphrodisias in the background, the Odeon, and miscellaneous artifacts set to one side. 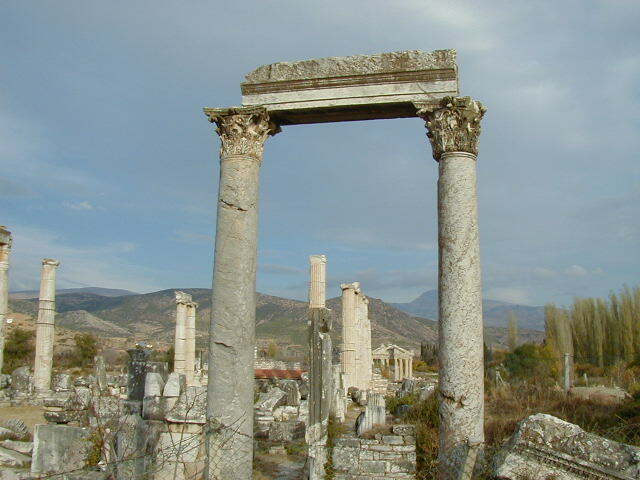 Last are two closer views of the Temple of Aphrodisias. 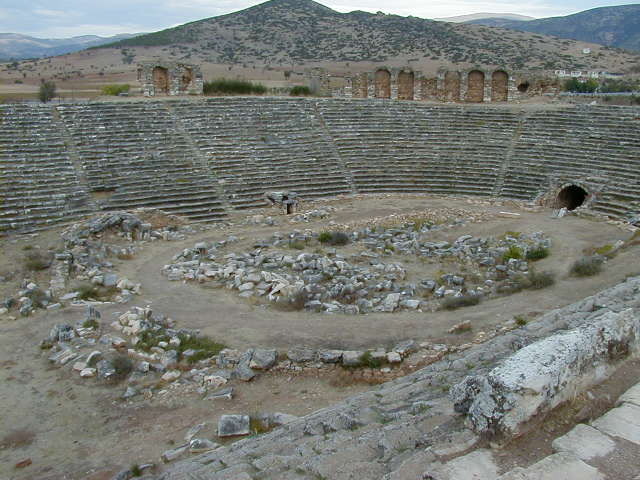 Further down is the Greek Stadium. 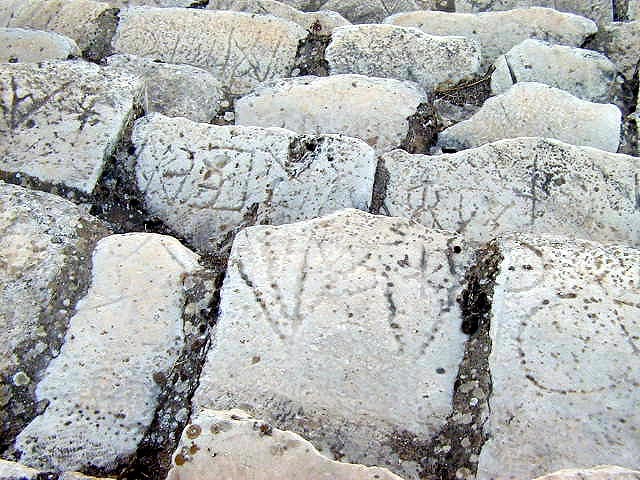 Greek stadiums were used for track and field athletic events, not the gladiator gore the Romans preferred. The first shot is of the excavations, barely started, uncovering the outside walls of the stadium. 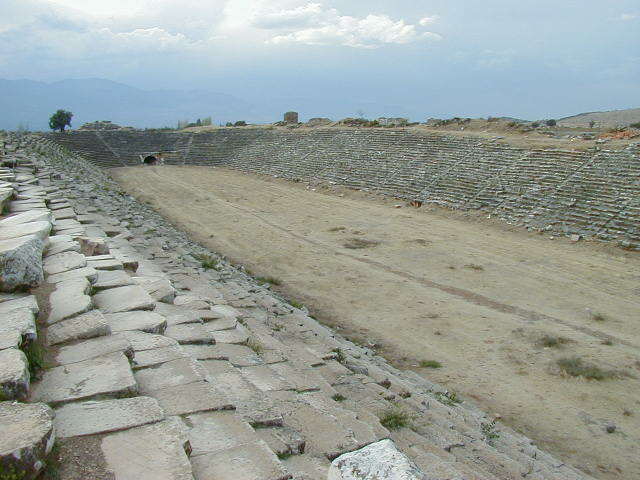 The stadium was 270 meters long, so there is a lot of excavation remaining to be done. 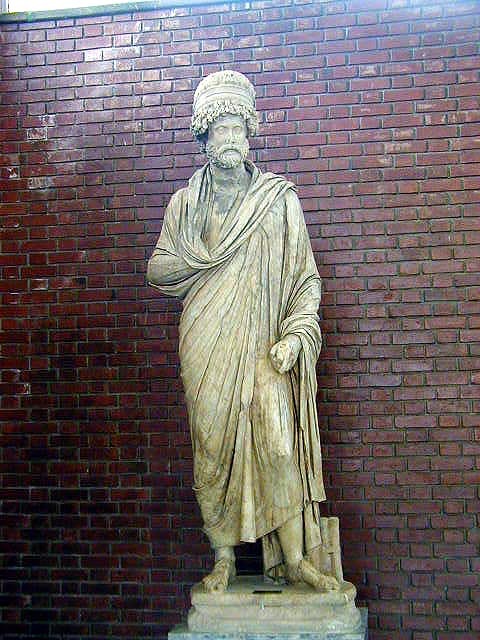 Once Rome began to dominate the city's culture, one end of the stadium was turned into a round field of combat for gladiators. 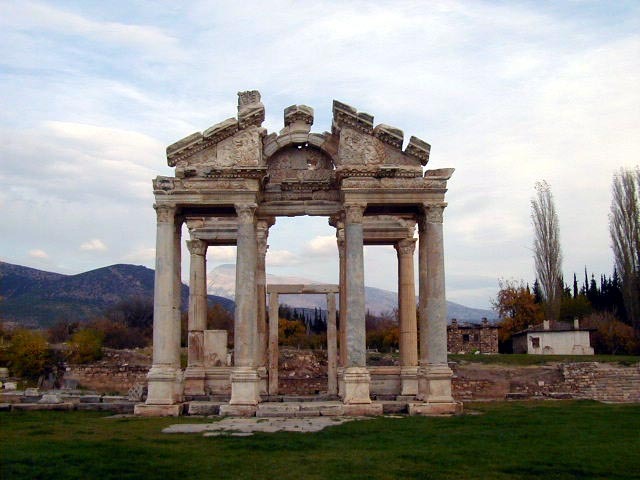 Towards the end of my tour of the city was the Tetrapylon, a decorative gate from the second century B.C. 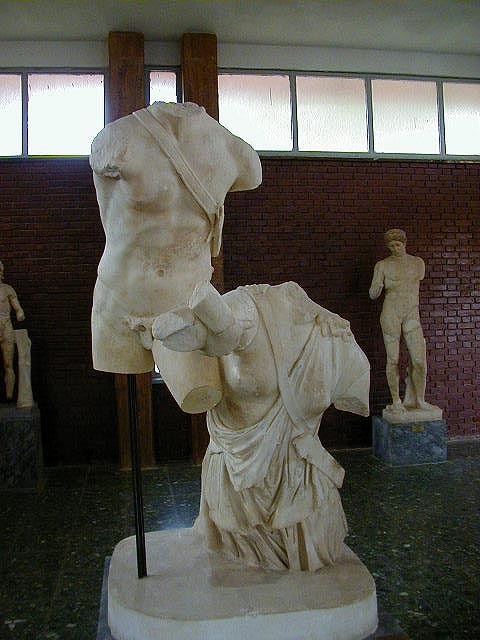 My last stop was the Aphrodisias Museum with some of the sculpture, reliefs, and other artifacts from the excavations. 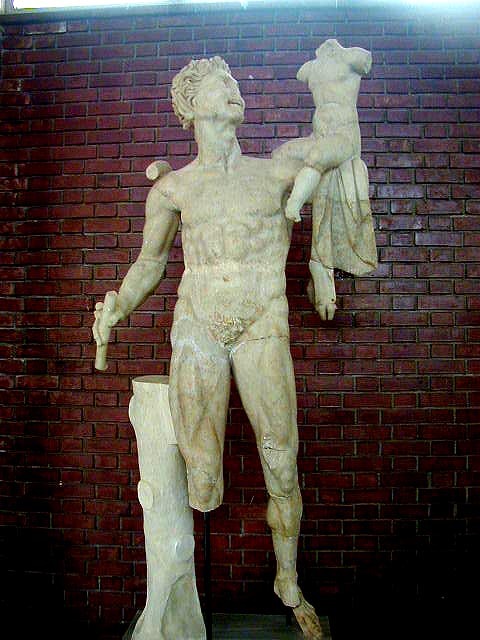 These are just a few of the statues; Satyr with the infant Dionysos (a common Greek theme), Achilles and Penthesilea, a collage of views of the Zoilos reliefs, and a couple of statues I didn't catch the name of. 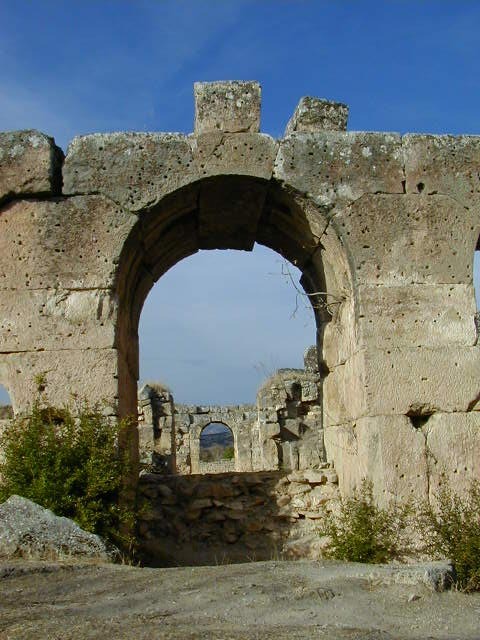 It was a rushed tour, but I had to allow plenty of time to get back to Selcuk. That is because I didn't know how I was getting back. I made it with a combination of walking, hitchhiking, an overpriced dolmos and buses. But as I said before, it was worth it. 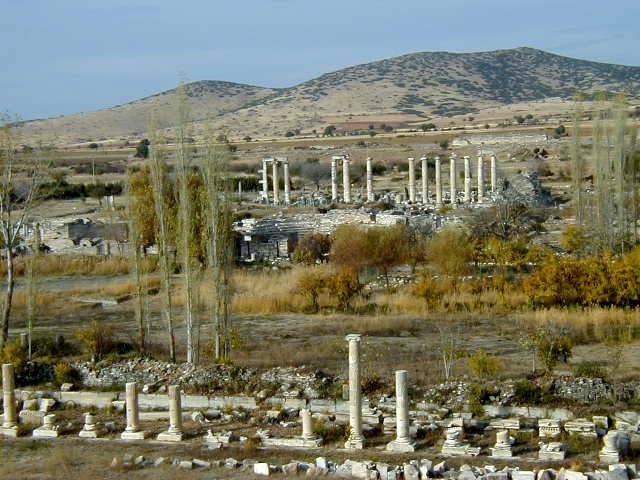 Aphrodisias will get even better with additional excavations. 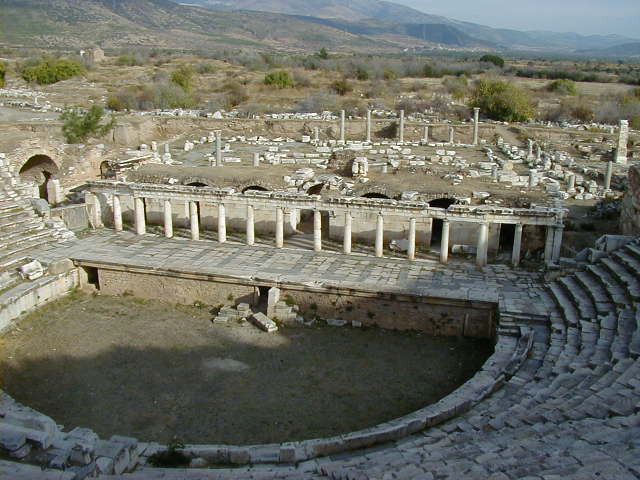 It's almost as good as Ephesus now. Give it a few more decades of work and it will be outstanding. 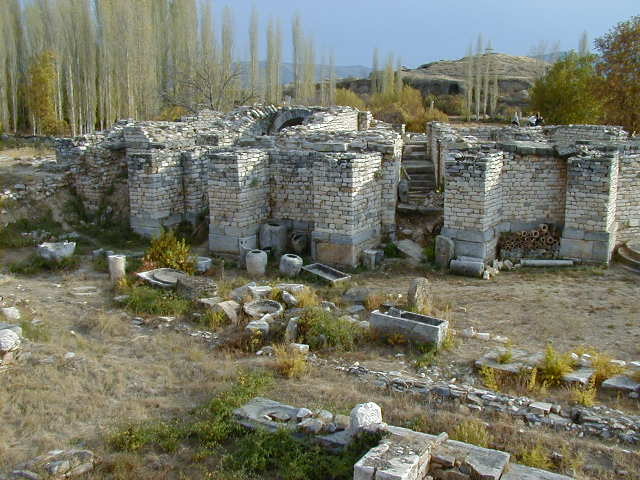 As much as I liked touring Aphrodisias on my own, I decided that eight hours of travel for less than two hours on site was too wasteful. 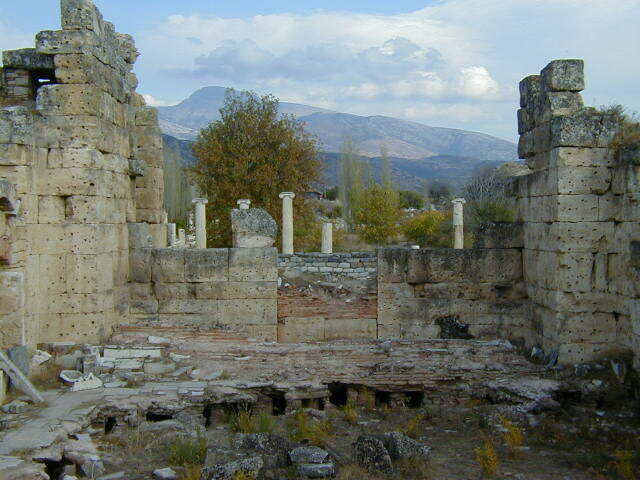 Back at the Artemis Guest House I signed up for an organized tour covering Priene, Miletos, and Didyma in one day.